GRAND RAPIDS, Michigan, (AUGUST 22, 2016) -- ArtPrize, the radically open international art competition and festival decided by public vote and expert jury, announced 2016 registration details for its Volunteer program, presented by Lake Michigan Credit Union. ArtPrize seeks volunteers—who through their energy and commitment provide the framework essential to the visitor experience—to fill over 1,000 volunteer positions and welcome visitors from near and far to the event this fall. Volunteer registration is now open on artprize.org, and the ArtPrize Volunteer season will officially commence at the annual Volunteer Kick-Off Party on August 26. ArtPrize Eight is slated to take place in Grand Rapids, Michigan from September 21–October 9, 2016. The dedication of community members is integral in making the 19-day event possible. With hundreds of individuals, friends, families, and groups stepping forward every year, volunteers are at the frontlines in welcoming over 400,000 visitors to Grand Rapids. The enthusiasm and tenacity with which they take on the tasks of each day keep ArtPrize a community-driven event, with many locals lending their time and ArtPrize expertise to continue its success. The online self-registration and schedule-building system at artprize.org is now open—allowing volunteers to select positions and shifts to meet their interests and availability. Volunteers have the opportunity to sign up for shifts from now through Sept 10th, this date marking the final day of required volunteer training. Everyone is invited to join in celebrating this year’s volunteers and the upcoming ArtPrize season with the annual Volunteer Kick-Off Party on Friday, August 26. This community event will be held at SiTE:LAB / The Rumsey Street Project. Concurrently, SiTE:LAB will be celebrating the work of Gordon Mata Clark with and Opening Reception & Pig Roast—a precursor to their ArtPrize Eight exhibition. Those interested in volunteering will have the opportunity to create a volunteer account on-site during the event. The ArtPrize Volunteer Kick-Off Party is presented by Lake Michigan Credit Union. All ArtPrize Volunteers must attend a training session before the event begins. Training will be held from September 6–11—prior to ArtPrize Eight Preview Week, presented by Edward Jones—with weekday, weekend, and evening sessions held throughout the week. During training, volunteers will hear from ArtPrize staff and partners about the event’s history and how it functions, as well as learn more about their specific shifts and what to expect out of their volunteer experiences. All training sessions will take place at the ArtPrize HUB/HQ, and signup is available now through September 5. Whether it be in education, hospitality, or wayfinding, there are a variety of volunteer opportunities to fit everyone’s schedule and interests during ArtPrize Eight. Volunteers have the opportunity to assist in the retail store, become fleet vehicle drivers to help transport VIP guests, act as ArtPrize tour guides, become docents, and more. New for the eighth annual event, ArtPrize visitors will find eight Neighborhood HUBS throughout the district, staffed by ArtPrize Welcome Crew volunteers. These HUBs duplicate the core service of the ArtPrize HUB/HQ at 41 Sheldon Blvd, as welcome centers, voter registration locations and guideposts for Wayfinding volunteers. Members of our Volunteer Welcome Crew will provide hospitality and event support, ensuring that all ArtPrize visitors are registered to vote and feeling confident and excited about what to see while exploring the neighborhoods. Also new to the Volunteer Program for ArtPrize Eight are volunteer positions working at the STEAM Village, powered by Switch. The STEAM Village Learning Lab will feature hands-on, immersive technology and experiential stations for students, families, and ArtPrizers of all ages. Volunteer positions include assisting art demonstrations, facilitating an after-school program, and serving as docents. Grand Rapidians looking to support the ArtPrize event in a different way may choose to host ArtPrize artists coming in from out of town. ArtPrize attracts artists to Grand Rapids from around the world, and the ArtPrize team works to match out-of-town artists with free, temporary housing to lessen the cost of participating in the event. For those who wish to get involved, but cannot offer their time in the volunteer program, artist hosting presents an equally important opportunity. The deadline to register for the Artist Hosting program is Saturday, September 3. Please e-mail exhibitions@artprize.org for more information. Volunteers enjoy a variety of perks for giving their time and energy. Every volunteer receives a free Event Guide and map, an ArtPrize Metro Card for free public transportation—10 rides on The Rapid and unlimited rides on the Silver Line BRT system—access to the Volunteer Lounge for refreshment and relaxation, and raffle entries to win prizes donated by local businesses and organizations. 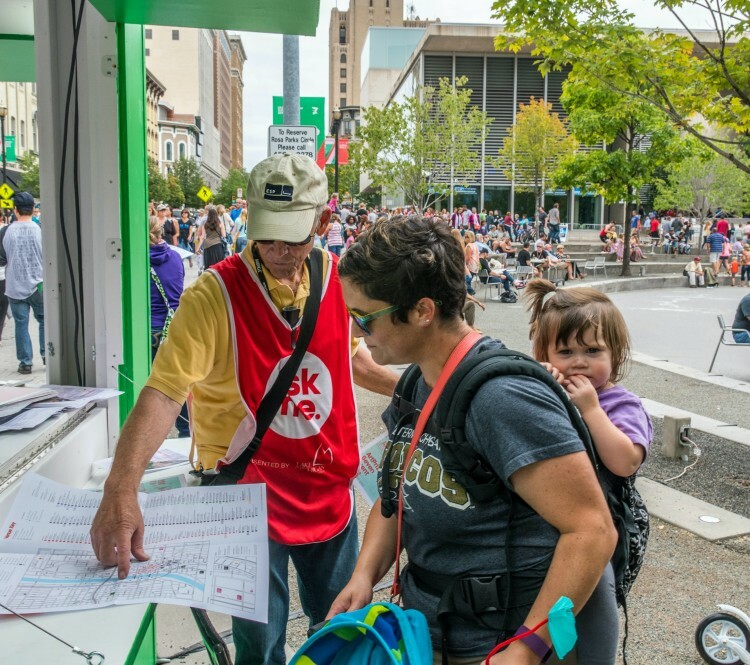 For every three shifts completed, volunteers earn discounts on ArtPrize merchandise. After five shifts, each volunteer will earn an exclusive ArtPrize Volunteer gift. For more details on the ArtPrize Volunteer Program and how to register, visit artprize.org/for-volunteers. ArtPrize Eight is slated to take place September 21–October 9 in downtown Grand Rapids, with satellite locations at Frederik Meijer Gardens & Sculpture Park and SiTE:LAB / The Rumsey Street Project.